One of the keys to create a survey that really generates insight into customer needs is creating the right combination of open-ended and closed-ended questions. How different are they? Each of these types of questions has its strengths and weaknesses. Open-ended questions allow for unexpected insights and freely expressed opinions, but almost everyone agrees that as far as an analysis goes, closed-ended questions are easier to be interpreted statistically. For those who work in market research, open-ended questions are ideal, since they facilitate the extraction of valuable and actionable insights that can be delivered to clients. Nevertheless, the resources involved in extracting insights from purely open-ended surveys can weigh heavily on a business. 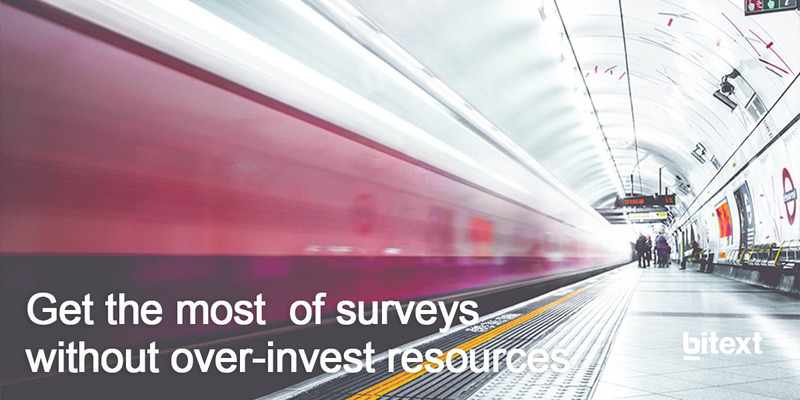 So what’s the formula for getting the most value out of surveys without over-investing in resources? In customer centric organizations, surveys are becoming more and more popular because they provide feedback that let companies draw conclusions to enhance their performance. However, designing a questionnaire that answers all the research objectives established is a complex task. In customer-centric organizations, surveys are quickly gaining popularity as a tool for obtaining extremely valuable feedback that permit companies to pinpoint what they need to improve their performance. Even though, designing a questionnaire that answers all the research objectives established is not an easy task. Closed-ended questions can increase response rates, since they require less effort from the respondents; nonetheless, closed-ended questions cannot uncover details or elicit the kind of unexpected responses from customers that can be transformed into insights. Open-ended questions, on the contrary, take more time to be analyzed, because there are infinite possible answers, and responses can be quite long. This large amount of information generated by open-ended survey questions is, nevertheless, the source of valuable insights that can be transformed into actionable recommendations for clients. When it comes to customer feedback, time is of great importance. Companies need to be able to respond as soon as possible if they want to achieve high levels of customer satisfaction. Surveys that present exclusively open-ended questions take far too long to be analyzed. This fact limits the capacity of businesses to swiftly analyze and turn feedback quickly into insights. The most advisable approach for customer surveys is, therefore, a balance between both types of questions. A quick search for the term “open-ended questions” on the Internet pulls up a wealth of articles recommending that companies try to use open-ended questions on a small sample, since most companies do not have enough resources to analyze large volumes of unstructured text-based data. What if the company has a large volume of data? Wouldn’t it be better to use all the data to draw conclusions that are more accurate and statistically valid across a large group? Sentiment analysis tools make it possible to extract overall trends, opinions and customer feelings from large volumes of survey responses while spending a fraction of the time and human resource involved in getting insights from raw data.